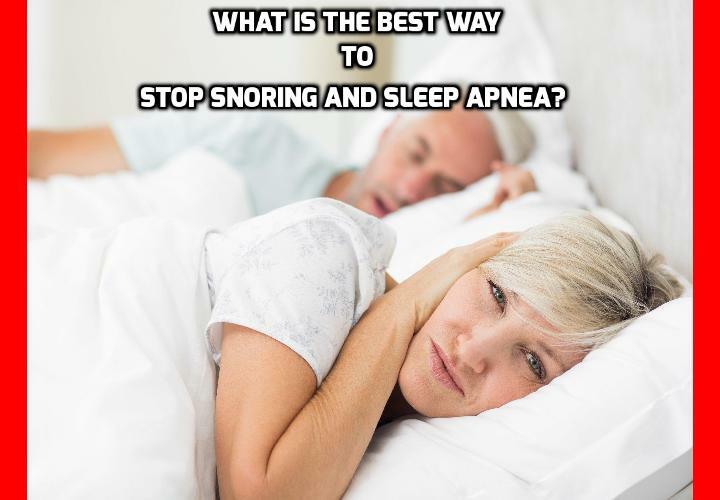 What is the Best Way to Stop Snoring and Sleep Apnea? As irritating as snoring is, most of us wouldn’t think it had any serious consequences, and if it did, we would not connect it to the cause behind destroying part of your skin. But a new study from Loyola University and a publication in the Journal The Ocular Surface reveals that connection. Also, if you noticed your skin being damaged in this way, you need to seek medical help, as it can be a sign of a much more serious condition. There is a condition called lax eyelid syndrome, which means that your eyelids are floppy and rubbery and easily flip over, even during simple movements such as turning over in bed and letting them come into contact with your pillow. It is not common, unless you have sleep apnea, like many snoring-afflicted people do. Since most people’s sleep apnea goes undetected, this eyelid condition maybe an indicator that your snoring is actually a sleep apnea in disguise. Researchers invited 35 people suspected of having sleep apnea into a laboratory to monitor their sleep properly. Through this study, 32 of them were diagnosed with sleep apnea. When they examined their subject’s eyelids, they found that 53% of those with sleep apnea had lax eyelid syndrome. That is a much higher percentage than the general population. So how does sleep apnea cause lax eyelid syndrome? Sleep apnea coincides with systemic inflammation throughout your body. Inflammation attacks and destroys a protein called elastin, a protein whose job is to allow skin to stretch and contract. Because your eyelids stretch and contract pretty much every time you blink, a lack of elastin can cause floppy eyelids. You’ve probably heard of several factors that contribute to sleep apnea, but food is very seldom discussed. And we’re not talking obesity (big contributor to sleep apnea), these are not foods that necessarily cause weight gain. Yet, one of them will make your sleep apnea twice as bad and the other two are little better. In this study published in the American Journal of Lifestyle Medicine, a team of scientists recruited 104 people newly diagnosed with sleep apnea. They first gave them a dietary survey to examine their typical consumption of various foods. They then measured their symptoms against the standard apnea–hypopnea index to measure the severity of their sleep apnea. This test records the number of apnea and hypopnea events you suffer per hour of sleep. Apnea is when your breathing stops completely, and hypopnea is when your breathing is much too shallow. Your score on the apnea–hypopnea index is determined by dividing the number of these events by the number of hours you sleep. A score of less than five is normal, between five and 15 is mild, between 15 and 30 is moderate, and from 30 upward indicates a severe condition. Dietary fat was the biggest contributor to sleep apnea. People whose diets consisted of more than 35% of fat scored an average of 36 on the apnea–hypopnea index, compared with the 18 scored by their peers, elevating the condition from low–moderate to severe. Another dietary influence on sleep apnea severity was processed meats, with those eating it often scoring an average of 42 on the index and those who ate it rarely or never scoring only 28. People who consumed more than two servings of daily dairy also suffered more, scoring 39 on average compared with the 26 of those who consumed less. So, if you suffer from sleep apnea, try to cut fat from your diet (especially animal fat), processed meat and dairy for a few days and see what happens. If you suffer sleep apnea, do this one thing before anything else. That’s according to a new study from the Flinders University’s Adelaide Institute for Sleep Health. This one thing battles one of the main causes of sleep apnea. But this study shows that it also provides a cure for the disease. The researchers recruited 40 overweight adults with a body mass index of 30 or higher, all with moderate to severe sleep apnea and mild daytime sleepiness. They were then placed on a six-month weight loss program with high protein meal replacement shakes, behavioural support techniques, advice from dieticians and exercise physiologists, and access to support groups. This is called the Flinders Program, a program that enables people to self-manage their chronic diseases. Their preliminary results show that this weight loss program could drastically reduce the worst drowsiness effects of sleep apnea. Once the daytime sleepiness left, weight loss obviously becomes easier, because people began having the energy to exercise and reduce their weight even faster. Previous PostPrevious What is the Best Way to Eliminate Snoring and Sleep Apnea? Next PostNext What is the Best Way to Stop Severe Sleep Apnea?